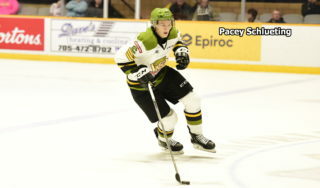 BUFFALO, N.Y. — Brett McKenzie scored the only goal of a shootout to give the North Bay Battalion a 4-3 victory Friday over the Kitchener Rangers in the Ontario Hockey League exhibition opener for both teams. Andy Baker, Luke Moncada and Justin Brazeau scored regulation-time goals for the Battalion, seeing its first action in the inaugural OHL Pre-Season Showcase at the HarborCenter. Goaltender Mat Woroniuk made 26 saves through three periods before the teams went straight to the shootout, forgoing overtime, per OHL exhibition season protocol. Connor Bunnaman scored two goals and Greg Meireles the other for Kitchener. Goaltender Luke Richardson faced 43 shots through 60 minutes, including 20 in the third period. McKenzie scored on the first shot in the shootout before Richardson denied Baker and Cam Dineen. Eric Guest, Meireles and Bunnaman failed to beat Woroniuk. Moncada tied it 2-2 during a two-man advantage 26 seconds into the third period on assists by Adam McMaster and Dineen before Brazeau scored unassisted at 2:15, emerging from the left side and reaching around Richardson to sweep the puck into the net. With Richardson gone for a sixth attacker, Bunnaman struck at 19:27, cutting to the net from the left wing to direct the puck home. The Troops, who trailed 1-0 after 20 minutes, tied it at 12:04 of the second period when Baker completed a three-way passing play with Daniil Vertiy and Kyle Potts, chipping the puck past Richardson from the right side after a pair of lateral feeds. 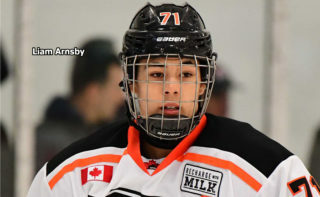 Meireles connected 2:14 later, taking off on a breakaway with Brandon Coe, the Battalion’s first-round pick in the OHL Priority Selection in April, in hot pursuit but unable to impede the attacker enough to prevent a high scoring shot. The Battalion outshot Kitchener 19-12 in the period, which saw Daniel Walker and the Rangers’ Logan Stanley draw fighting majors at 19:57. 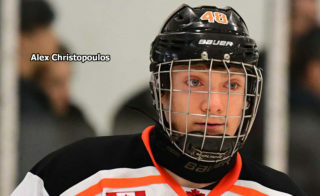 Stanley received an instigating minor and game misconduct, putting Kitchener two men down after Jonathan Yantsis had been called for tripping at 19:41. The teams skated on even terms through the first period before Bunnaman scored off a turnover at 19:41. He seized the puck in the slot, spun and fired the rubber low inside the left post. Moncada had North Bay’s best chance late in the Troops’ only power play of the period but failed to put home a backhander from a scrum in the crease. Assistant coaches Scott Wray and Adam Dennis ran the Battalion bench while head coach Stan Butler watched from the media area. The Battalion, playing exhibition games outside Canada for the first time, faces the Windsor Spitfires, reigning Memorial Cup champions, at 12:30 p.m. Saturday and the Flint Firebirds at 12:30 p.m. Sunday to complete its Showcase schedule. 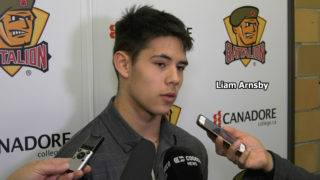 Other entries in the six-team event are the Erie Otters, who won the OHL title last season, and the Peterborough Petes. BATTALION BULLETS: The HarborCenter sits next to KeyBank Arena, home of the National Hockey League’s Buffalo Sabres. 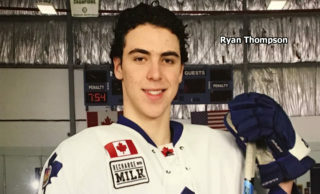 The twin-pad facility is the site of the NHL Scouting Combine and will be the venue for some 2018 World Junior Championship games … Opening line combinations featured McMaster centring left winger Moncada and right winger Coe, Potts pivoting left winger Vertiy and right winger Baker and Kurtis Evans centring McKenzie on left wing and right winger Brazeau. 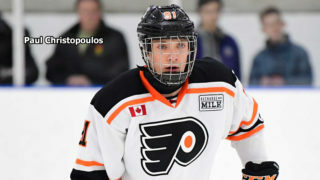 Rhys Forhan centred left winger Walker and right winger Patrick Brown … Defence pairings were Eric Allair with Brady Lyle, Dineen with Travis Mailhot and Simon Rose alongside Payton Vescio … Coe, Evans, Brown, Mailhot, Rose and Vescio made their OHL debuts, while Moncada saw his first action with the Troops after a June 27 trade with the Guelph Storm … Julian Sime backed up Woroniuk … The Battalion scratched Jesse Saban, Brad Chenier, Luke Burghardt and Alex Robert, while Jacob Ball and Riley Bruce, both recovering from injuries, and Adam Thilander, with the Swedish national junior team, aren’t on the trip … Dineen wore the captain’s ‘C’ with Potts and Brazeau the alternates … The Troops overnighted at Niagara Falls, Ont., on Thursday … The Battalion went 1-for-4 on the power play. Kitchener was 0-for-2.